Recipe courtesy of the National Watermelon Promotion Board. Repeat the layers again, ending with the yogurt. 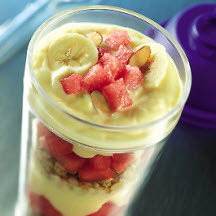 Garnish with banana slices, toasted almonds or coconut, small chunks of watermelon and/or a strawberry. Recipe and photograph courtesy of the National Watermelon Promotion Board.